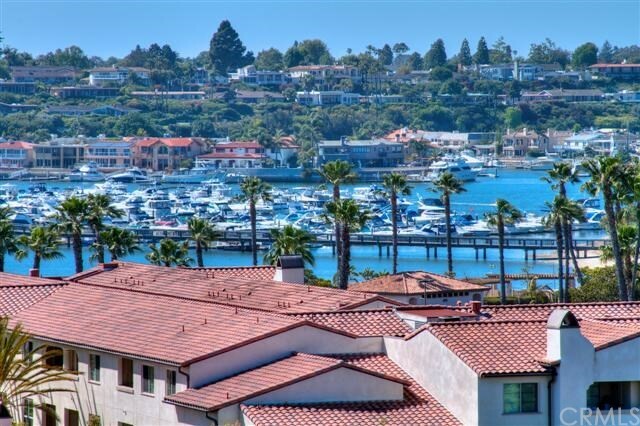 Resort style living at the beautiful Villa Point condominiums, near Balboa Island, Fashion Island, Corona del Mar, and the Upper Newport Bay Nature Preserve and Ecological Reserve, with 1,000 acres of preserved and pristine wetlands just across Jamboree from the community. This controlled access gated community has two swimming pools heated year round, two whirlpool hot tubs, two fitness centers, Clubhouse and barbecue/picnic areas at the pools. Lower level corner home features stunning views of the Back Bay, marina and boats, gorgeous sunsets and sparkling city night light views. There are no stairs. The home faces directly west with wonderful sunlight. Recently renovated with marble floors, quartz countertops, crown moldings, new carpeting...it is a beauty. The very spacious rear patio is bathed in sun and has a large Jacuzzi brand hot tub. The garage opens directly into the kitchen and has a storage area. High ceilings, two master bedroom suites, spacious walk in closets. Gas log fireplace in the living room. Breakfast nook in the kitchen and dining area next to the living room. Very low ANNUAL Mello-Roos tax is about $150.00. 20 pound weight limit on dogs. Listing Provided By James Mann of Coldwell Banker Platinum Prop.